Want To Go See the Monarchs in Mexico? Let's GO! 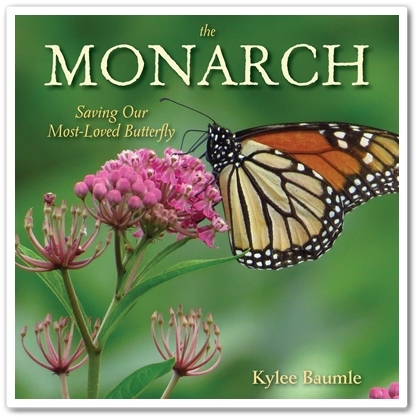 Announcing My New Book About Monarchs! We got an entirely new flock of chicks on Easter Sunday this spring - eight of 'em. 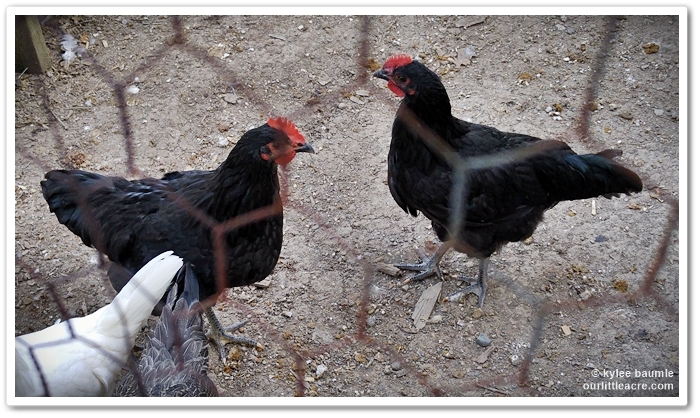 I'd say we got eight hens, but it turned out that the two Black Australorps were roosters. We enjoyed the crowing - sort of - but we don't want to feed any that don't feed us, so luckily a local took them off our hands. They wanted Black Australorps for breeding, so they're happy and we're happy. We've been getting eggs since mid-July, starting with Owl, the Leghorn. She's been a laying machine, having only missed two days since she started laying. Buffy, the Buff Orpington, started laying a couple of weeks later and she's been pretty consistent too. Five days ago, Ruby, our Rhode Island Red, started laying beautiful darker brown eggs. Today, I got a real surprise when I went out to gather eggs. There were FIVE! Yesterday, three, today, five! The new layers are the ISA brown and one of the Ameraucanas. That's the thing with having so many different breeds - we know who is laying and who isn't. One of the new eggs today was blue, and since we have two Ameraucanas and they lay blue eggs, we know that one of them is the only one left to start laying. They're also the only two hens that don't have names. How about Dottie and Dinah? We ate our last store-bought egg about a week or so ago and I'm really glad to be back in the backyard egg business. I also love how beautiful these eggs are. In spite of the differences in their colors, the shells themselves come in only two colors. That's right. Hens only lay eggs that are two basic colors - white and blue. "But what about the brown ones?" you say. If you look, the next time you crack open a brown egg, you'll find that it's white on the inside. The brown coloring is a pigment that the hen applies to the outside of the egg shortly before she lays it. One time, I gathered an egg right after one of our first flock Buff Orpingtons had laid it and it was still wet. I wiped the moisture off and some of that brown coloring came off! But once it dries, it's on there for good. We had scrambled eggs for supper tonight, so I took some photos to show you that it's true about the coloring. As if it wasn’t exciting enough yesterday, when I announced my upcoming new book, The Monarch: Saving Our Most-Loved Butterfly, I’ve got more exciting news today. I’ve mentioned that the number one thing on my bucket list is to visit the monarchs at their overwintering location in central Mexico. Each fall, they travel up to 3000 miles one way to the oyamel fir forests high in the Sierra Madre mountains. The habitat there is perfect for them to spend the winter until it’s time for them to make their way north in March. This location in Mexico wasn’t known by those studying monarchs until 1975. Of course the locals knew the monarchs came there. How could they not know? 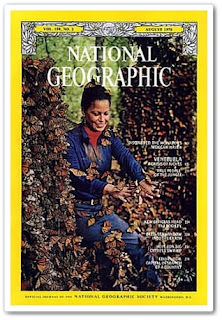 I have a copy of the 1976 National Geographic magazine, telling the story of the discovery to the rest of the world. Now, I’m going to be traveling to the state of Michoacán in central Mexico to see them for myself! I can’t tell you how thrilling this is for me. But not only am I going, I will be the co-host, along with a local guide, for a small group tour. This means YOU can go with me! 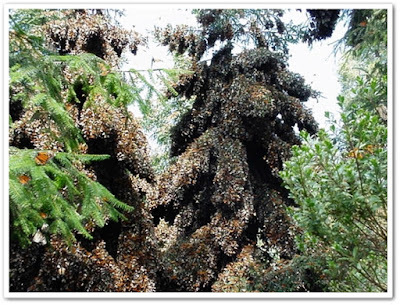 This is a six-day trip (February 28 – March 5, 2017) that will take you to two of the monarch sanctuaries, where you will stand surrounded by thousands and thousands of monarchs, dripping from the trees, and fluttering all around you. It will be magical. The monarch sanctuaries and the greater Monarch Butterfly Biosphere Reserve are located about 60 miles northwest of Mexico City, in the Transvolcanic mountains of central Mexico. They have been designated a UNESCO World Heritage Site (United Nations Educational, Scientific and Cultural Organization) and as such, is legally protected by both the Geneva Convention, The Hague Convention, and international law. But first, we'll visit one of the local villages and experience culture that is native, and we’ll see an archeological site. 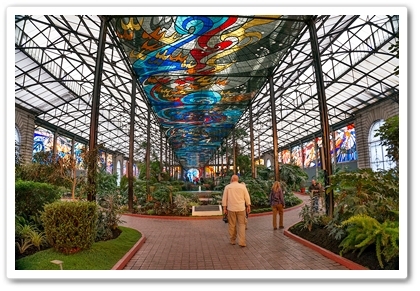 Then, after two days of visiting the monarch sanctuaries near Angangueo, we’ll travel to Toluca to see the Cosmovitral Botanical Garden – a football-sized building, whose walls and ceiling are stained glass works of art. There are over 500 different species of plants showcased in the garden, but you’ve never seen anything like this beautiful structure. We’ll begin and end our trip in Morelia, the state capital, which is also a UNESCO World Heritage Site, and you’ll need to arrange your airfare to and from the airport there (MLM). You’ll find all the details and the itinerary for the trip here. Our tour agency, S&S Tours, is based in Sierra Vista, Arizona, specializing in small-group tours to various parts of Latin America. They’ve been in business since 1993 and have a BBB rating of A+. They've been visiting the monarch sanctuaries in Mexico every year since 2003. Due to the sensitive nature of the sanctuaries, the number of people allowed in at one time is controlled. Our group will be no larger than 10 people, including me. I already know of one other person that’s going on the trip, so that means there are only 8 more that can go. To secure your spot on the trip, you can download the application here and follow its instructions. I hope you’ll join us! It’s sure to be a fun adventure! It will come as no surprise to many of you when I tell you I’m writing another book and that the subject of the book is monarch butterflies. It is now listed on Amazon and is available for pre-sale! In my newspaper column, on Facebook, and in this blog, I’ve talked about the situation with monarchs: their decline in population, the reasons for that decline, and what we can do about it. It’s a subject about which volumes could be written, but I’m limiting my take on it to just one. The Monarch: Saving Our Most-Loved Butterfly is an assembling of a wide variety of information that I’ve researched, as well as experienced in my own garden. I have included many astounding facts about the monarch, its physiology, life cycle, and why the monarch matters. There are a few DIY projects included that are easy and will help our favorite butterfly in some way. Those of you who want to learn more will find plenty of reference material to help you keep adding to your knowledge about the monarch beyond what is in my book (and there’s a lot to learn). I’ve been intimately involved with monarchs here at Our Little Acre for more than ten years now. I raise them from the egg stage all the way through release of the adult butterfly and in my book, I’ll show you how to do it too. While there is some technical information presented, with plenty of photos to help illustrate much of it, it won’t overwhelm you. It will fascinate you. If you’re not careful, you might just fall in love with the monarch, as I did so many years ago. As a citizen scientist, I contribute to the collection of information by monarch researchers by reporting data to Journey North, as well as late summer and autumn tagging of migrating monarchs through the University of Kansas. I’ll share how you can do this, if you so choose. The Monarch: Saving Our Most-Loved Butterfly is a work of passion and love and my hope is that it will open your eyes to one of nature’s most amazing creatures. Though the current situation with them could be described as depressing, my book isn’t. There’s plenty of reason for optimism, as you’ll see, and I’ll show you how you can be a part of that. Yes, you can make a difference. Don’t doubt it. The book will be released on April 3, 2017, but is available for pre-order now. It's a hardcover book and lists for $18.95. If you order through Amazon now, they guarantee if the price goes lower between now and its release (very likely), they’ll honor the lower price. But my hope is that those of you who read it will find it to be worth far more.